Chatty Penguins adds some winter magic to your bedroom. The hand [painted chatting penguins are wandering across a snowy landscape holding tiny lanterns. To compliment the bedding is matching cushions with contrasting orange piping. The perfect design to make your bedroom cosy and snug this winter. 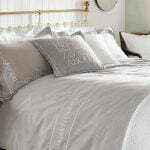 Embroidered Pillows and cushions of this range are made form an extremely soft linen cotton. The design has an natural luxury feel that you would expect to find in a boutique hotel. All you need now is delivery of breakfast in bed and a welcoming cup of tea.